The purpose of the Apprenticeship Program is to develop a qualified, versatile and safe work force. To be competitive, contractors must have workers who are both safe and skilled. Apprenticeship will give you the necessary skills, both on the job and in class, to become a valued construction team member and qualified union labourer. The C.C.W. program consists of up to 2,400 hours of experience both on the job and in school. Wages start between 70% and 90% of the journey person rate depending on the skill level of the individual and will increase as their skills develop. Construction labourers need good manual dexterity, hand-eye coordination, and balance. They also need the ability to read and comprehend all warning signs and labels on a construction site and reading skills sufficient to understand and interpret plans, drawings, written instructions and specifications. They should be capable of working as a member of a team and have basic problem-solving and math skills. Employers want workers who are hard-working, reliable, and diligent about being on time. Computer skills also are important as construction becomes increasingly mechanized and computerized. Construction labourers clean and prepare construction sites to eliminate possible hazards, dig trenches, mix and place concrete, and set braces to support the sides of excavations. They load, unload, identify, and distribute building materials to the appropriate location according to project plans and specifications on building construction projects. They also tend machines; for example, they may mix concrete using a portable mixer. Construction labourers often help other craft workers including carpenters, plasterers, operating engineers, and masons. At highway construction sites, construction labourers clear and prepare highway work zones and rights of way; install traffic barricades, cones, and markers; and control traffic passing near, in, and around work zones. They also install sewer, water, and storm drain pipes, and place concrete and asphalt on roads. They operate, read, and maintain air monitoring and other sampling devices in confined and/or hazardous environments. They also safely sample, identify, handle, pack, and transport hazardous materials, and clean and decontaminate equipment, buildings, and enclosed structures. Other highly specialized tasks include operating laser guidance equipment to place pipes, operating air, electric, and pneumatic drills, and transporting and setting explosives for tunnel, shaft, and road construction. Construction labourers operate a variety of equipment including pavement breakers, jackhammers, earth tampers, concrete, mortar, and plaster mixers, electric and hydraulic boring machines, torches, small mechanical hoists, and laser beam equipment. To perform their jobs effectively, construction labourers must be familiar with the duties of other craft workers and with the materials, tools, and machinery they use. Construction labourers often work as part of a team with other skilled craft workers, jointly carrying out assigned construction tasks. At other times, construction labourers may work alone, reading and interpreting instructions, plans, and specifications with little or no supervision. Although most of the skills acquired will be on the job, a portion will be in class, possibly up to 16 weeks over a 2 year period. Please contact the hall in Sudbury to obtain further information. A number of external sources of funding are available. 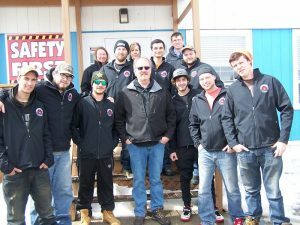 Service Canada $1000.00 taxable cash grant available to registered apprentices once they have successfully completed their first or second year(level) of an apprenticeship program in one of the Red Seal trades. Max 2 grants per apprentice.